My darling, very gorgeous little lad Henry has kindly kept me up most of the night for the past couple of nights. The amount he is up during the night would have made me start to suspect he could be part vampire but his serious lack of sleep during the day has ruled that one out. I just don’t breed sleepers. Damn. Luckily for me I have had two angels visiting me in the form of my parents this week. They have been doing the cooking, helping out with the washing, playing with the kids, showering them in presents (the boys approve), taken them for the afternoon while I had my bi-annual pedicure (that’s once every 2 years right, not twice a year? I always get that one confused) and Dad even mowed the lawns and wait for it….cleaned my seriously ‘rustic’ (his words) oven. So despite the lack of zzz’s this week I have been pretty well looked after. I feel just like J-Lo, who supposedly has an entourage of 30 people looking after her, I contend that I would also look that good if I had a Team Kate working around the clock on me…okay maybe not that good but I wouldn’t have people asking me whether my mascara has smudged under my eyes when it’s really just some really attractive dark circles…I don’t have time for mascara these days. 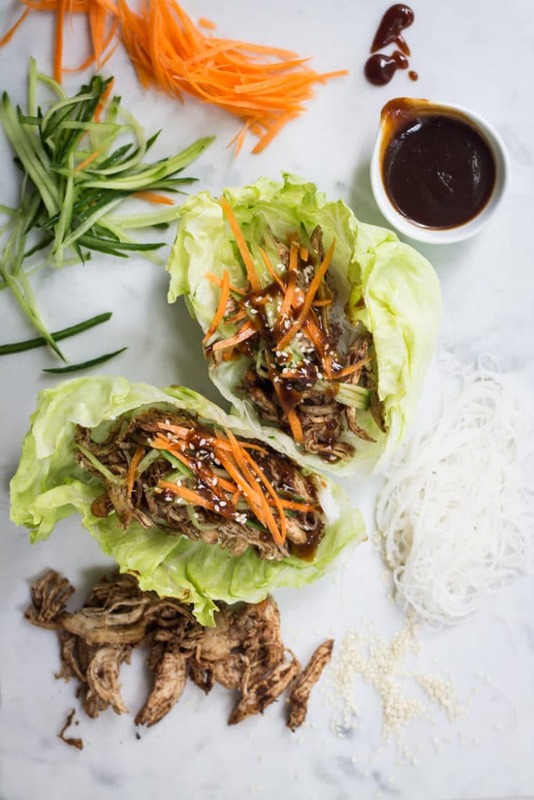 Normally I don’t have the parents here and obviously don’t have Team Kate on hand so I need an arsenal of quick, easy and tasty meals for midweek…welcome 5 Spice Lettuce Cups. Fresh, simple, super tasty and ready in less than 20 minutes. 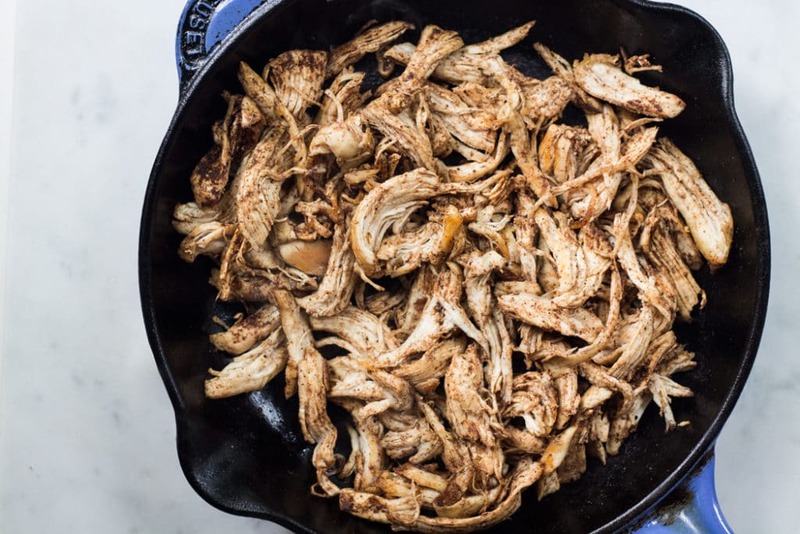 You need this recipe, if you can even call it a recipe it’s so simple. I was inspired by a recipe I saw Nigel Slater do on his Kitchen Diaries show a while back. He took some leftover roast chicken, heated it up, added some Chinese 5 spice powder and served it. I thought it was a great way to use up leftover chicken which can sometimes be less than inspiring. 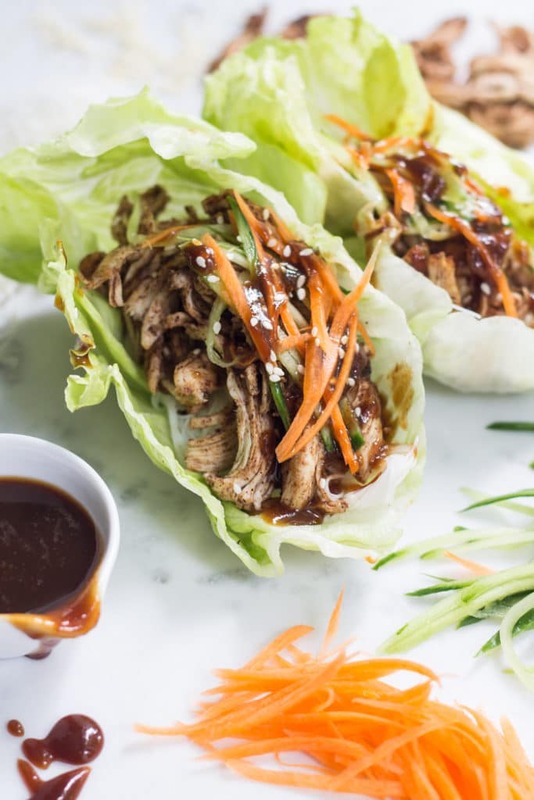 My hubby and I love lettuce cups so 5 spice chicken + basic lettuce cups + hoisin sauce = a whole mouthful of awesomeness….in less than 20 min! I’m not one for kitchen gadgets because real estate is a premium in my little 1.9 sqm (20sqft) kitchen so I pretty much have the basics plus the addition of a standing mixer this year (OMG! that changed my baking world) which takes up half my bench space but is worth it. 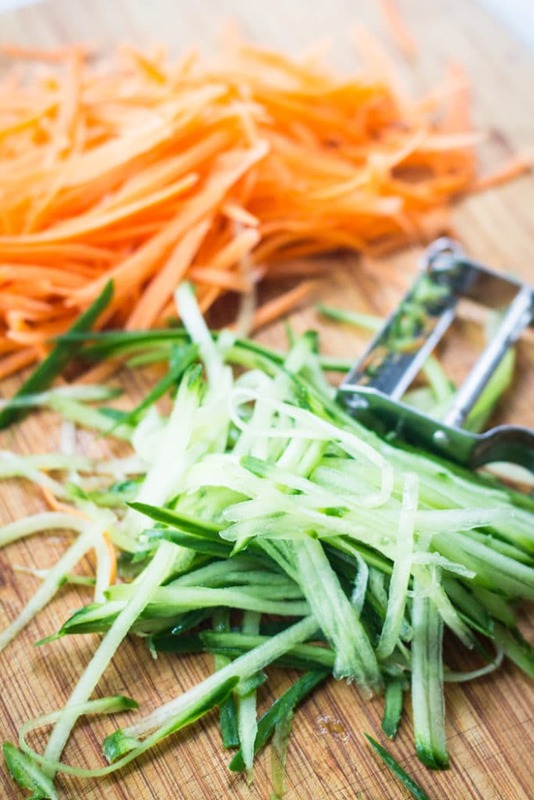 The one superfluous gadget I have and absolutely love is my julienne slicer (which doesn’t take up must space come to think of it, but it’s a superfluous gadget nonetheless). 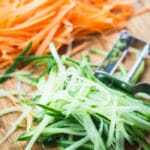 For years I battled with my big chefs knife to make tiny little matchsticks out of carrot and other veggies and because I do not have the knife skills of Jamie Oliver my carrots usually turned out like big tree chunks in a delicate coleslaw or my lettuce cups….enter the julienne peeler . Yes, this changed my world too. My sister-in-law got me onto them and I have never looked back. It’s seriously as simple as using a potato peeler and out pops the most amazing little matchsticks, just like a pro. Totally awesome and the best $6 I have spent in a long time! Enjoy everyone! Happy Summer by the way, first day today and wasn’t it gorgeous. Heat 1 Tbsp sesame oil in a medium frypan (skillet) on med-high heat. Add the chicken and cook for approximately 5 min until heated through. Add 5 spice powder and sea salt and continue to cook for another 5 minutes or until chicken is starting to get just a little crispy. This is how I prefer it but you can leave your chicken soft if you like. While the chicken is cooking cook the vermicelli rice noodles. Heat the kettle, place the noodles in a bowl then pour over boiling water. Leave until the noodles turn opaque which is literally only a couple of minutes (longer if you are using thicker rice noodles). Drain, add a few drops of sesame oil and set aside. 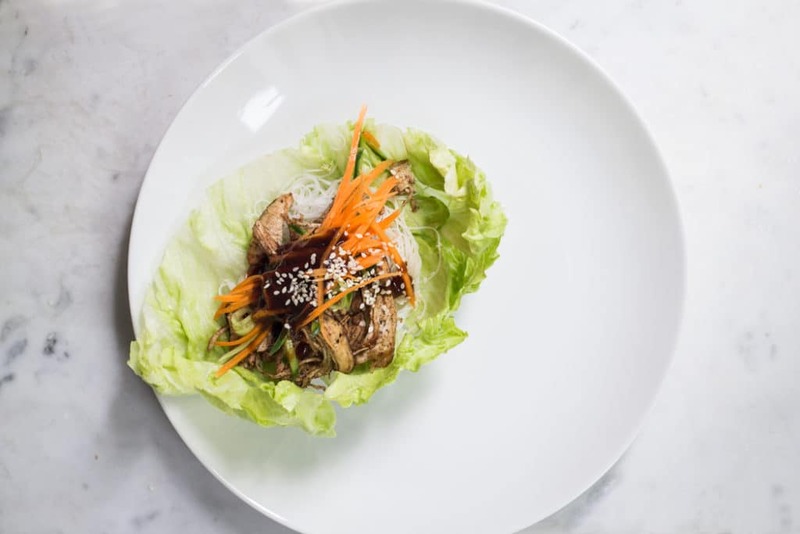 To serve take a lettuce leaf, add some rice noodles inside it, top with chicken, carrots, cucumber, hoisin sauce and some sesame seeds. Serve immediately. 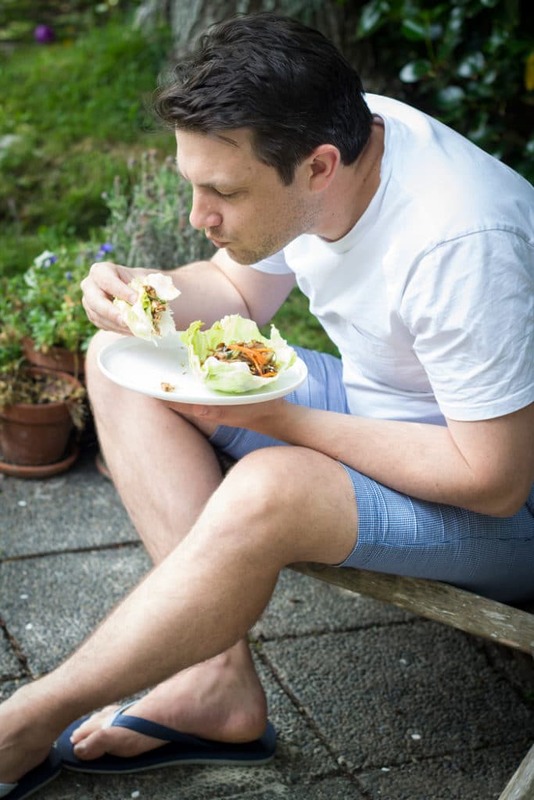 I love to put all the ingredients out on the table and let people make their own lettuce cup - it’s a fun way of eating and people love making their own! I like to use leftover chicken for this from a roast chicken the night before. 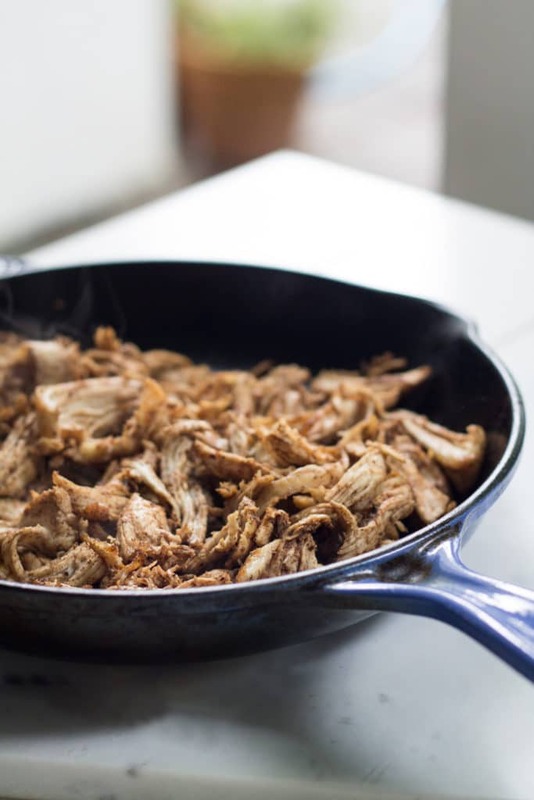 If you don’t have leftover chicken then buy 500g/1lb of free-range chicken breast (or thigh) and cook for approximately 20-30min or until cooked and shred. I just lettuce cups so much. We can add whatever we want and make it absolutely guilt free too. Well it’s only 6 months later and I’m replying to your lovely comment Kankana! I am so so sorry! I have no idea how you managed to sneak in that comment without me noticing. I was just going through my comments and noticed it. Is your son in preschool yet? I hope so! My parents aren’t usually in town so I can empathise with you. My little man just went into preschool last month and I am definitely enjoying a little mummy/blogging time! 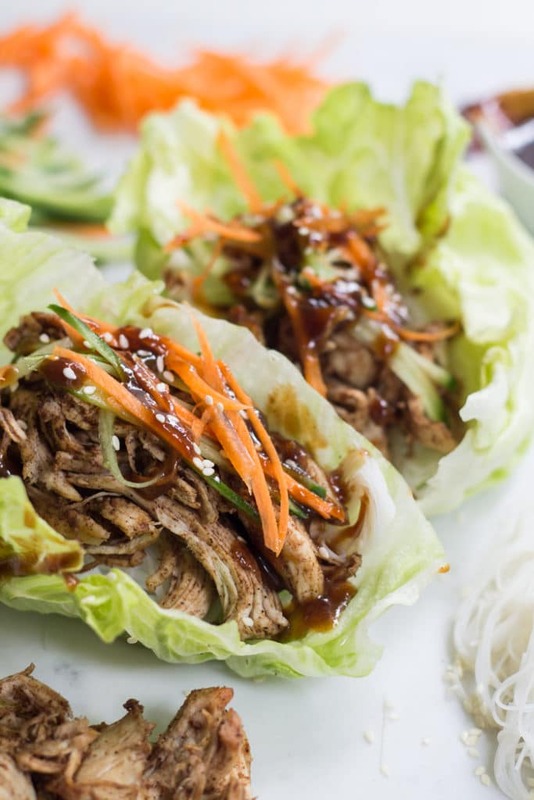 These are some finger-licking lettuce cups! Can’t wait to prepare them.